The Cross House was built in 1894. It is located at 526 Union Street, in Emporia, Kansas. I purchased the house in March 2014. Want to learn about the background of the house? My blog posts about the restoration are below. 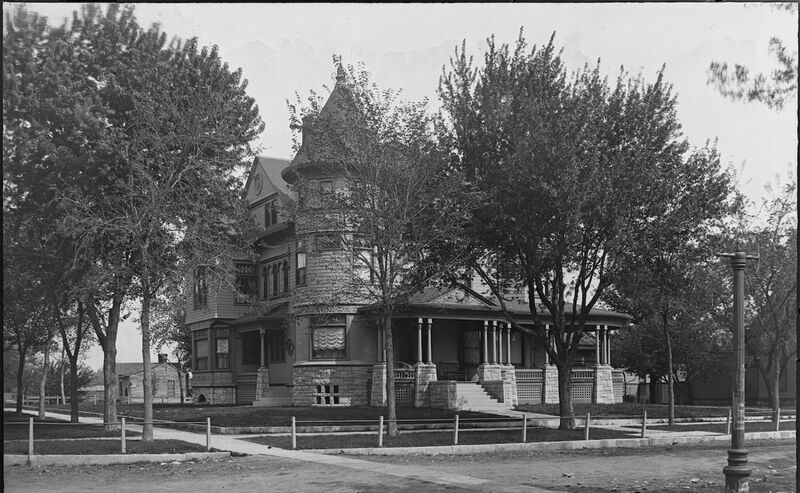 The Cross House, Emporia, designed by architect Charles W. Squires. Currently displaying blog entries in Chronological Order. Switch to Most Recent. Currently displaying blog entries in Most Recent Order. Switch to Chronological Order. Why, Oh Why, Didn’t I Buy A One-Story House? WARNING: A very long post about my day. But it was a good day. …but how did Mrs. Cross get to her porch? …and did Mrs. Cross belatedly need a conservatory? My Doors Are Back From The Hospital!!!!! Can A Wreck Of An Old House Actually IMPROVE Your Health? Have You Ever Jacked Up A House? SCARY! How To Heat A Big Old House. A Theory. Can I Paint Today? Can I? Can I, Please? Can Santa see the Cross House from the North Pole? Wanna See My 1894 Ice Chest? Whew! 2014, What A Year! Can I Get An Award For The Most-Ever Cracked Plaster Walls? History as revealed by Wallpaper. Part 1. History as revealed by Wallpaper. Part 2. Refinishing The Wood Trim. HELP!!!!! Refinishing The Wood Trim. PART 3. Refinishing The Wood Trim. PART 4. Recreating the Cross House in…Ireland? Refinishing The Wood Trim. PART 5. Refinishing The Wood Trim. PART 6. ANNOUNCEMENT! What Mr. and Mrs. Cross Would Have Known. What A Difference A Few Days Make. The Waiter Has Been Butchered! EEK! The Great Column Adventure! Part 1. The Great Column Adventure! Part 2. The Great Column Adventure! Part 3. The Great Column Adventure! Part 4. The Great Column Adventure! Part 5. The Great Column Adventure! Part 6. The Great Column Adventure! Part 7. The Story of the Lost Dramatic Sweep. The Glory of the Glass. Part 2. A Conundrum. The Great Column Adventure! Part 8. The Mystery of the Bathroom Notches: REVEALED!!! W! H! O! E! E! My Big Learning Curve About Historic Tile. Part 1. My Big Learning Curve About Historic Tile. Part 2. My Big Learning Curve About Historic Tile. Part 3. My Big Learning Curve About Historic Tile. Part 4. Roofing the House. Part 1. Roofing the House. Part 2. Roofing the House. Part 3. Roofing the House. Part 4. Roofing the House. Part 5. …and now comes the fun part: DECORATING! An Ode to Porcelain. Part 2. And an Invitation. An Ode to Porcelain. Part 3. BREAKING NEWS! …so…maybe not THIS shade of blue? …so…maybe not THIS shade of blue? PART 2. Pipes and Cast Iron and Burly Men, Oh My! …And Putting It Back Together. I Am Freakin’ Out, Man! Freakin’ Out! Small moves, Ellie, small moves. The Dead Have Some Explaining To Do! Want To Earn A Million Dollars? A Gala at the Cross House. Part One. Brian and Bailey! MY HEROS! Creating a New Kitchen in an Old House. Part One. Creating a New Kitchen in an Old House. Part Two. Creating a New Kitchen in an Old House. Part Three. Does this idea make any sense? Zounds! Batman moves to the Cross House! A Breathtaking Update About Peacocks! Creating a New Kitchen in an Old House. Part Four. A Wall. Full of Information. Get ready. Get set. GO!!!!!!!!!!!!!!!!!!!!!!!!!!!! The Cross House Comes Alive…Politically. I’m Dreaming of a…Green Christmas! 2015. The Year-End Update. WARNING: It’s a LONG update. Please, will you join me in the Parlor? …and speaking of Old Cisterns. Desperately Seeking a Lost Roof Finial. In Two Parts. Does ANYBODY on Earth Sew??????????? Changing THE PLAN with some Stencil Magic? What do you think about a…GO FUND ME for the Cross House? GO FUND ME for the Cross House? Done! Eek! Eek! I AM SOOOOOO EXCITED! Why Kelly is Sooooooo Sweet! How To Decorate a Victorian-Era House? Wanna meet my Yale & Towne hardware? On The Hunt…For Missing Bits! Will You Join Me in the Butler’s Pantry? Damn! WHAT is a period-correct faucet???????? ARGH! Making Pocket Doors Work. Making Pocket Doors Work. WHOEE! ZOUNDS! A day of discoveries! Tuckpointing a Historic Chimney. HELP! The DREADED Six Rule! PART II. The DREADED Six Rule! PART III. Zounds! A new Discovery! PART II. Porch railings and lattice, oh my! The Great North Gable is…PAINTED! Aliens Attack the Cross House! A Nefarious Theft at the Cross House! Recreating Missing Finials and Missing Muntins, Oh My! Tamara, will you please join me in the 1894 telephone closet?